Simple is best. 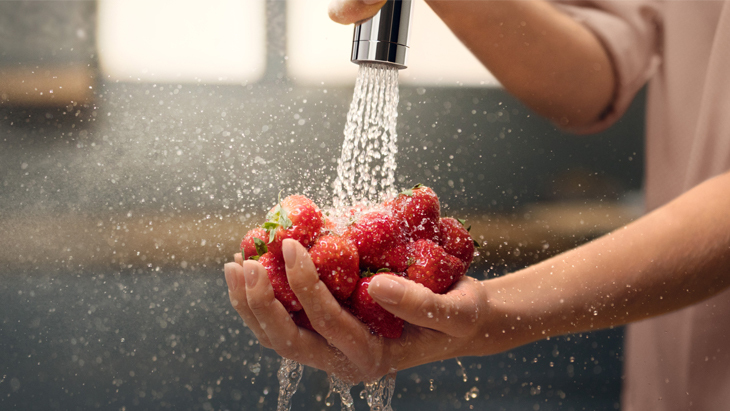 With the new kitchen mixers Metris Select and Talis Select you can control the water at the touch of a button. Press once to turn the water on; press it again to turn the water off. The Select button allows you to turn these state-of-the-art kitchen mixers on and off in an instant. And not just with your fingers, but also the back of your hand, your forearm or elbow. This not only makes it easy to use, but also conserves valuable resources. Those who love cooking attest to the fact that the simple but clever button makes everyday kitchen chores a breeze. Check out the smooth work flow when the Select button is combined with a (two-jet) pull-out hand spray. Cooking, washing up, filling with water, or cleaning will not only be a breeze, but the extra half a metre will give you more room to move. And you only need one hand. And the Metris and Talis Select designs? Simply good. Perfect to hold and perfectly designed: Find out everything you need to know about Metris Select kitchen mixers. Slender, multi-functional, elegant style: Find out everything you need to know about Talis Select kitchen mixers.